Kidney cancer. 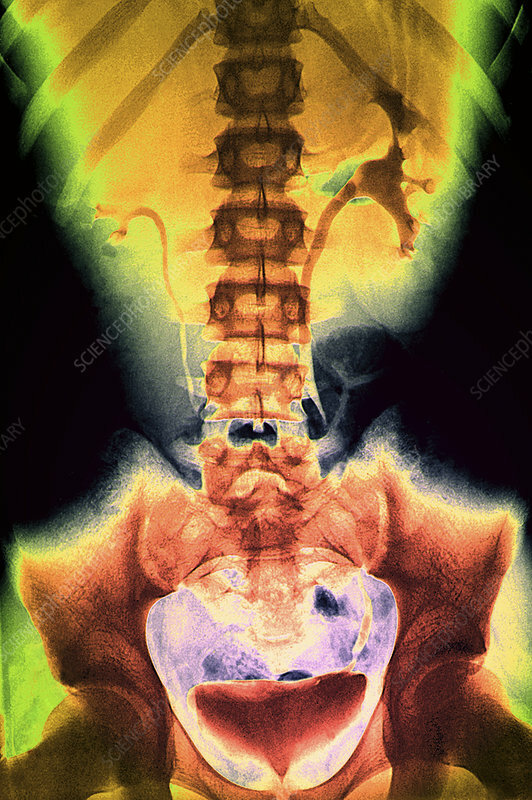 Coloured urogram (X-ray) of the abdomen of a patient with a malignant (cancerous) tumour (grey) in their right kidney (left). Kidney cancer is most common in those over 60, with males being twice as likely as females to be affected. Risk factors include, smoking, high blood pressure and long term dialysis. Renal cancers are usually not found until the tumour is quite large. Treatment is with surgical removal of the tumour or kidney. The cancer responds poorly to chemotherapy and radiotherapy.